Un Certain Regard 2015 presented in competition 19 films hailing from 21 different countries. Four of the works were first films. The Opening film was An by Naomi Kawase. 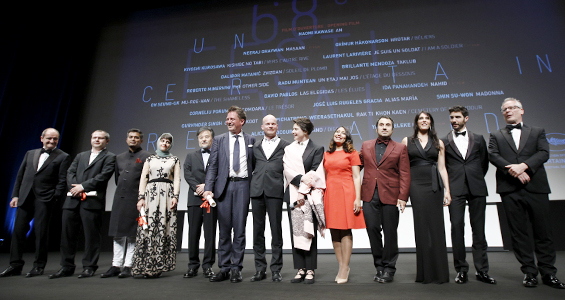 Under the presidency of Isabella Rossellini (filmmaker – United States, Italy), the Jury was comprised of Haifaa al-Mansour (director – Saudi Arabia), Panos H. Koutras (director – Greece), Nadine Labaki (director, actress – Lebanon) and Tahar Rahim (actor – France). President-Isabella Rossellini had this to say; “We, the jury, would like to thank the Festival de Cannes for inviting us to be part of the Jury for Un Certain Regard. The experience of watching nineteen films from twenty-one countries was memorable. It was like taking a flight over our Planet and its inhabitants… Any anthropologist would be envious of us. We would like in particular to thank Thierry Frémaux and his team for their incredible kindness. I cannot refrain from expressing also my personal gratitude to the Festival for having chosen my mother Ingrid Bergman for the poster of the 68th edition of this festival.